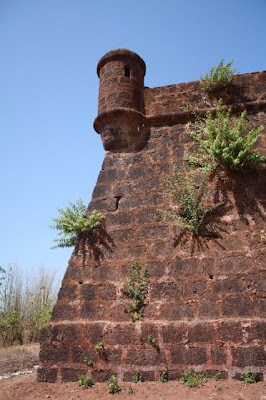 After a sumptuous meal at Panjim, we decided to go in search of Fort near Alorna. 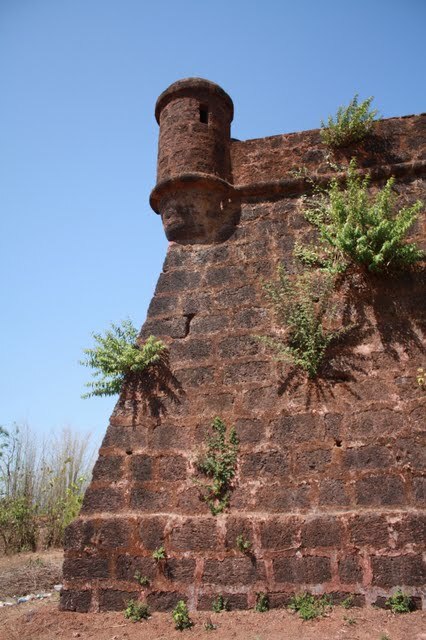 The location of this fort as per our pre-trip research was somewhere in northern Goa nearby to Mapusa. Our loyal road map/GPS (Eicher Good Earth Road Atlas) also showed a fort near Alorna. But the local map we bought in Goa (whatsongoa.com) had no signs of the same. When we tried to match the maps, the local map showed a place named Aldona and a fort little further from this called the Corjuem Fort. With an assumption that both these places (Alorna and Aldona) could be the same, we headed towards Mapusa. Later we came to know that there are actually two different forts . 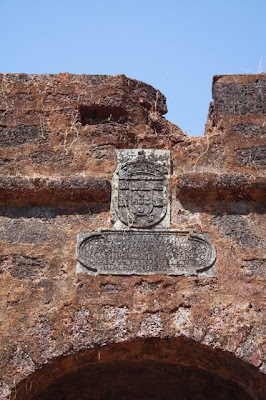 After some inquiries with the locals, we finally reached Aldona and followed the directions marked by the Government of Goa 'Protected Site' to reach the fort. 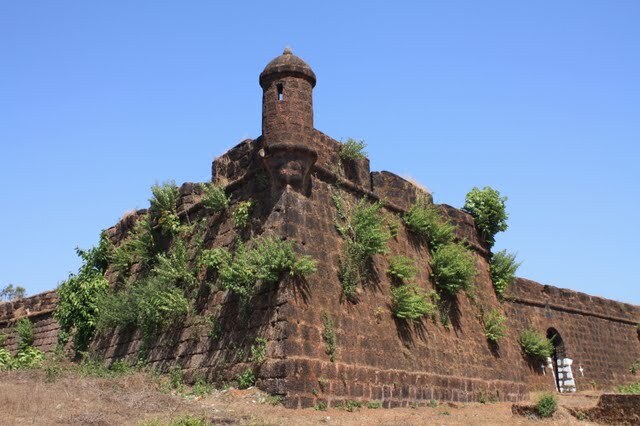 The fort is believed to have been built by the Portuguese in the 16th century and was used as a strategic point to attack the Marathas and the Bhonsles. This fort is also associated with a Portuguese lady soldier named Ursula e Lancaster, who tried to make it big in a man's world. She disguised herself as man and joined the army. The Corjuem Fort could easily be one amongst the smallest of forts of India. 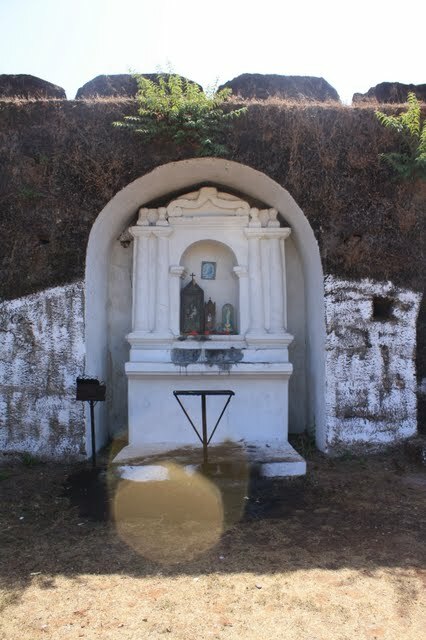 Nothing much remains inside the fort walls except a well (source of water), a chapel, a room/pantry and four ramps. The sturdy fort walls are in a good shape even without any maintenance. There is no entrance fee. Directions: For directions, click on the Location tab below. 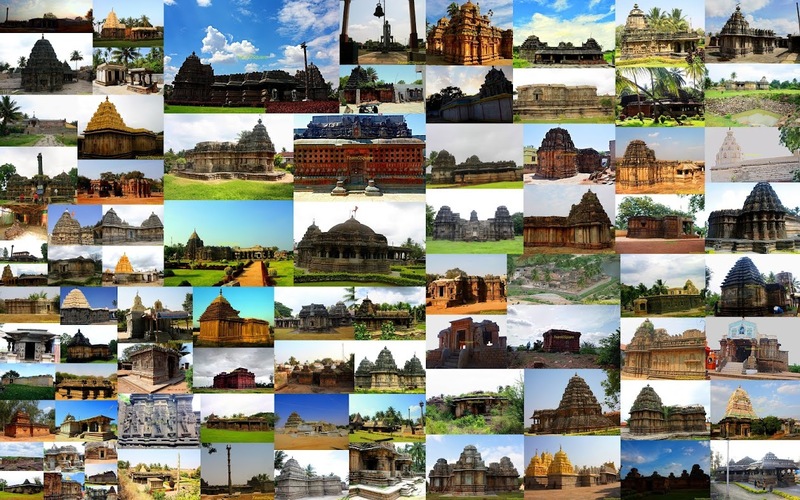 Places To visit nearby: Chapora Fort, Fort Aguda, Arvalem falls, Nanjus Fort, Vagator Beach, Anjuna Beach, Baga Beach, Calangute Beach, Mayem Lake, Lamgao and many more. What a fascinating place!! Your country has so much wonderful history! Really enjoyed your marvelous photographic tour of the fort! Have a lovely evening and a great tomorrow! Imposing magnificient structure! Awesome photos, the inscriptions are intriguing! Impressive account of another impressive place..! Is this where Dil Chahta Hai and other movies shot? @ Srinidhi , Dil Chahta Hai was shot at Chapora fort . very big one and looking so beautiful!